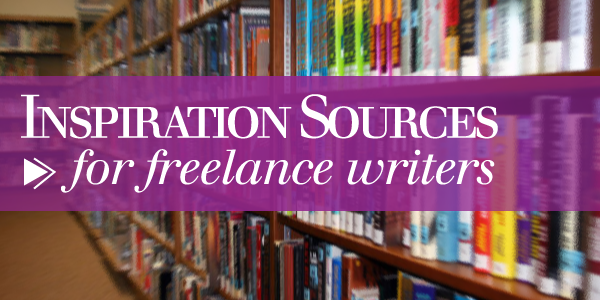 If you’re a freelance writer who likes to write about topics that interest you, it can sometimes be difficult to come up with ideas for article or blog posts. I get a lot of my inspiration for the posts and articles I write from discussions I have with people, articles and books that I read, and things that happen in my own life. However, I recently read an e-book called “The Renegade Writer,” which is really geared toward people who do their writing offline – in other words, they send proposals for articles to different magazines, rather than writing articles on sites like Textbroker. Even though the book is geared toward offline writing, there were several suggestions provided of places to find ideas for articles to submit that could work well for people who write online as well. This post will focus on those ideas. This of course goes back to reading – if you receive a newsletter on a subject you’re passionate about, you could try writing about something mentioned in that newsletter. This is one place I never would have thought to look for article ideas. There are government reports available on all kinds of different subjects, such as health, agriculture, and many others – and the best thing about government reports is that they have no copyright, so you can use the information in the reports without worrying about plagiarizing someone else’s work. You can be put on press lists for many different companies and organizations, and if they publish a press release about a subject that’s interesting to you, you can always do further research and write an article or blog post about it. If you read an article in a trade magazine about a subject that interests you, you can always write an article or blog post about it. Something you read in your local paper could possibly appeal to a broader audience. Once you’ve written something, you should get as much mileage out of it as you can. Why not try writing articles or blog posts with a different slant on something you’ve written previously? One example that was given in the book is that one of the authors wrote an article about ways to trick yourself into eating less for Oxygen magazine, and then wrote the same article for Muscle Media magazine, but with a different slant. I actually have done this with a few of the posts I’ve written here on Work at Home Adventures as well – when I first discovered the Scribie transcription website about 18 months ago, I wrote a review of it – then I recently went back and looked at the site again and saw they’d made some changes, so I wrote a new review with details about those changes. In addition, there are ways you can write articles on topics others have written about, without actually stealing the article. Asking yourself how the writer could have done better –If you read an article that you think is weak, you could find a way to rewrite the article – for example, you could write a stronger article by adding more research. Put your “editor cap” on and figure out how the article could be better. Writing an article or blog post that’s the opposite of one you just read -One example provided in the book is, you read an article on advertising methods that work – you could write an article about advertising methods that don’t work. Figuring out who else would be interested in the article – You might read an article in one magazine that could be re-written for a different audience – for example, an article on a certain type of cuisine could become an article about restaurants in your area that offer that type of cuisine. Figuring out how to narrow down a broad idea – One example given was reading an article on martial arts (broad topic) and writing an article about how to get started in a certain type of martial arts, such as tae kwon do. Figuring out how to broaden an idea – On the flip side, if you read an article about how to get started in tae kwon do, that might give you the idea to write an article about different forms of martial arts. When we think of holidays, days like Thanksgiving, Christmas, New Years’, and Valentine’s Day come to mind. But there are a lot of holidays that are celebrated in other countries, as well as holidays that are celebrated internationally, that we may not be aware of. These can make excellent topics for articles or blog posts – for example, people who like to write about environmental issues could write an article about Earth Day, which is celebrated internationally every April 22nd. To see which holidays are celebrated in different countries, or even internationally, check out this link. These are just a few ideas for how to find inspiration for writing – I’m sure there are many others. If you’re a writer, I’d love to hear where you find inspiration for writing! HI Erica , glad to find you , Just want to know about write article on knoji for me , how do you work ?